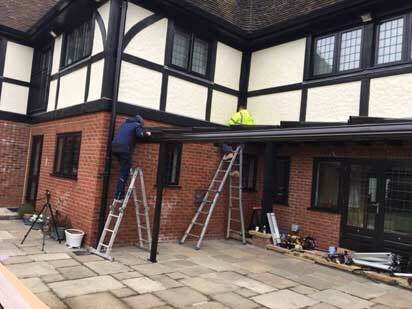 Savills are delighted to of recently completed this glass patio roof installation in Brentwood, some people refer to glass patio roofs as glass verandas or glass canopies. However, you wish to describe these high-quality outdoor solutions we are sure everyone can agree on one point they look fantastic. Our customer certainly agrees and could not be happier with their final installation. Due to our unpredictable weather, the Weinor Terraza glass patio roof is the perfect outdoor solution at first sight of rain a quick dash for the patio will see you home and dry under your stylish permanent glass roof. 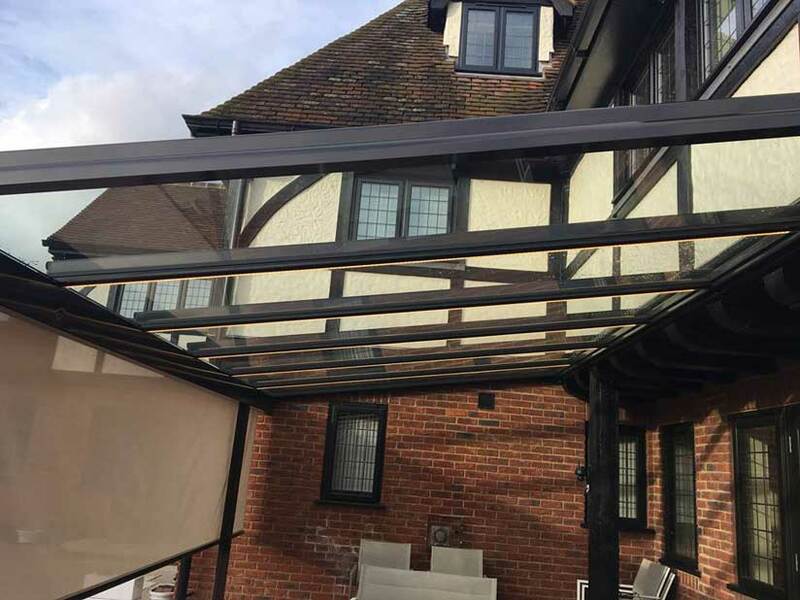 This glass canopy is not short on style; the frame can be produced in up to 53 colours meaning that unlike the British weather you can have it all your own way. Contrary to popular belief our summer is not all wind and rain! For those lazy Summer days, the Terrazza glass patio roof has a perfect partner in either the Sotezza II under mounted conservatory awning or the WGM2030 over mounted awning. Relaxing evenings in this Brentwood garden will never be the same, energy efficient led lights will set the perfect mood to enjoy balmy summer evenings just that little bit more. Glass patio roofs are more elegant than a conservatory yet they offer similar protection from the elements; with this in mind, it is easy to understand why Glass Canopies are becoming so popular in the South East. 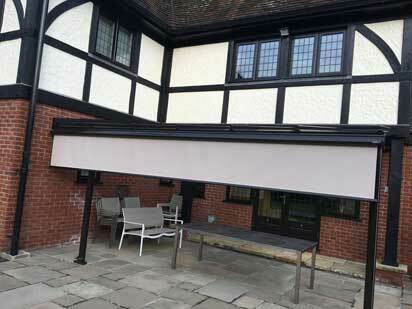 Savills The Awning Company, have been installing awnings and outdoor living solutions for the past 15 years as a business we only install high-end Weinor products this is because they are; highly customisable, sturdy, and above all, beautiful. Based in Ashford; Savills supply and install Weinor Products in Essex, Kent, Surrey, Sussex, and London. Feel free to get in touch and arrange a no obligation survey; our team are passionate about outdoor living. We don’t do high-pressure sales tactics just straightforward honest advice.